Hey guys, I thought I’d do an overview of the outfits and things happened this year. Its been a crazy roller coaster ride with major ups and downs but I’m glad I’ve kept my feet on the ground and continued to blog as much as I could. – Lets start with January, I’ve laid out this post focussing mainly on the outfits themselves, because I believe that is an aspect that fashion bloggers are forgetting. It’s not just about your perfect doll face or the quality of your content, if you are passionate and creative with your style that’s all what matters. -Its obvious in January that the Autumn/Winter colour palette is still continuing, this is because here in Wales it was freezing. 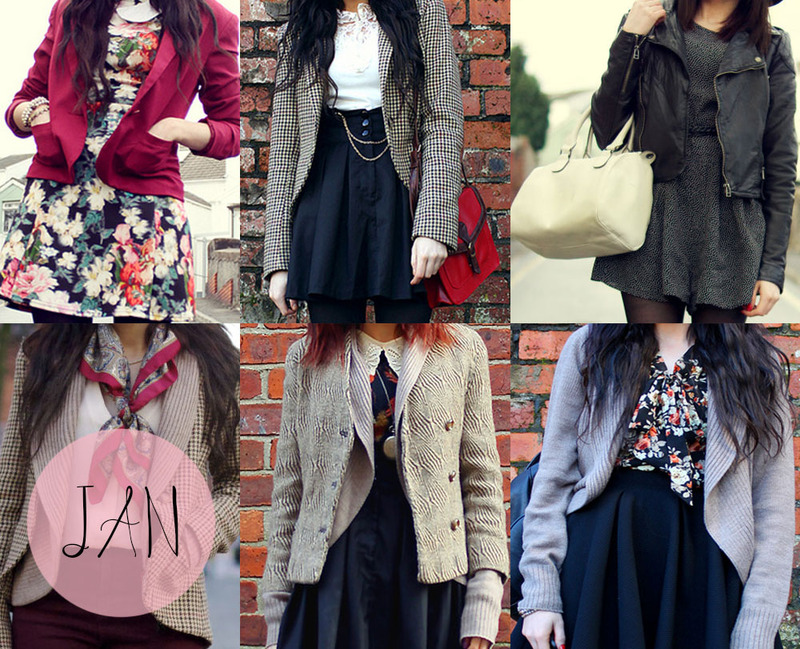 I wore my tweed blazer a lot and went back to my vintage style with the use of florals and pleated skirts. -January was such a fab start, whilst attending Miss Guided Press day with Ashleigh in London, it was the first time meeting her and we clicked instantly. I wore the spotty playsuit from Miss Selfridge to the Event, and the high heeled boots was not a good choice, my feet killed walked around London. -I also worked with Swansea Life Magazine on a street style feature for Jan and it was scary approaching strangers but so much fun putting the article together, its something I wish to continue in 2015. Worked with: Sugarhill Boutique, Warehouse. –February was a quiet month, with the weather still being rubbish and the skies were grey. 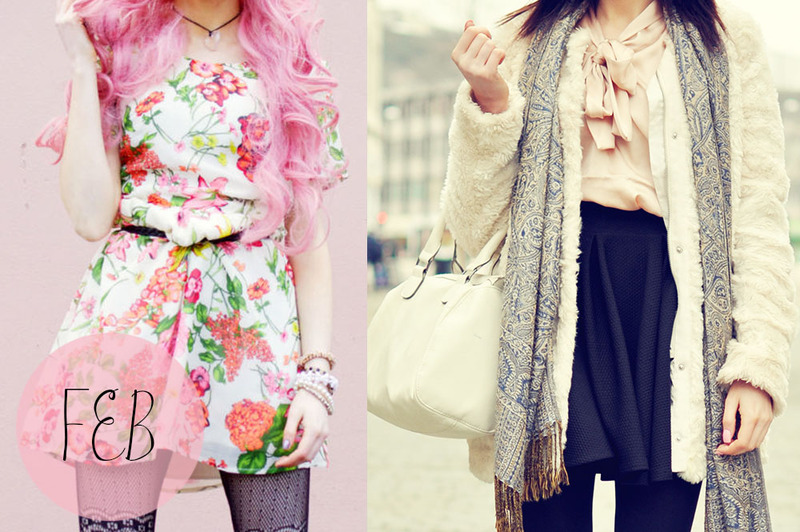 I was longing for putting on my pastel coloured clothing and start taking more creative photos. So there weren’t very many posts for this season, it was quite hectic with going to London Fashion Week for the first time, I completely wore the wrong outfit. Everyone was dressed in Black and I looked like a kawaii doll. But i didn’t mind because when we managed to get into the Meadham Kirchhoff show I fitted right in with all the other quirky individuals. – March was the beginning of Spring, you could feel it in the air. I bought a new fragrance, Dolce by Dolce Gabbana and it completely set the mood for this seasons fashion style. I started to become inspired by this years Pastel trend and wished I could have bought more pieces like Charlotte Fisher did, her Instagram was heavenly. I was lucky enough to be selected as part of the ASOS Access All team which allows you to stay updated with the latest trends, competitions and blog events. It was still a quiet month as I had a lot of work to do to past first year photography. –April was a fantastic month, came back home for Easter holidays and ended up blogging a lot more. 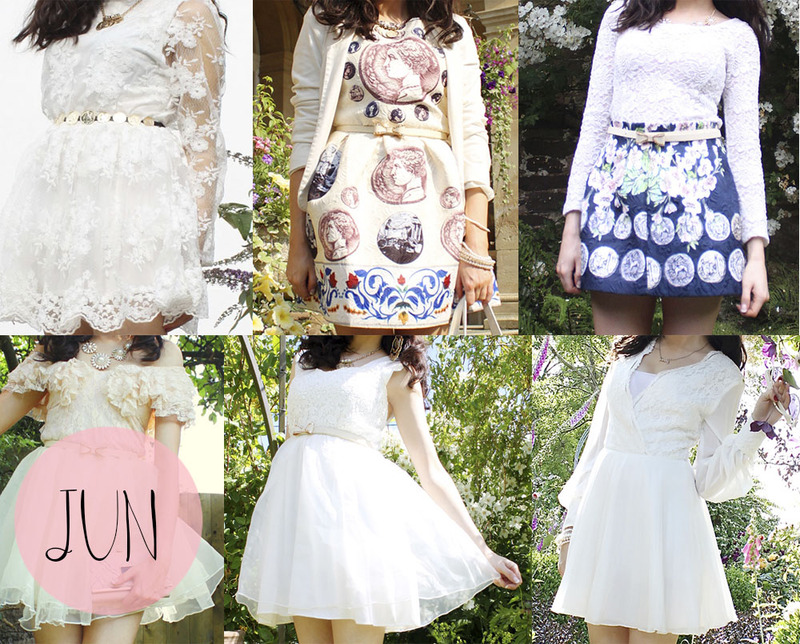 I was heavily inspired by Dolce Gabbana SS14 collection, with the beautiful blossom prints and roman coin accessories. Miss Guided sent me a beautiful silk playsuit I had my eyes on at the January Press day, it gorgeous to wear but I still need to style it properly. It was great to come home and see Bert and admire all the trees and flowers all in bloom for Spring. Worked with: OASAP, Miss Guided, Dolly Darling,Choies. –May was a difficult month, I experienced my first heartbreak. We separated for about 6 months, it didn’t work out living together after only knowing each other for a year or so. But the biggest lesson I have learnt looking back on the situation is that you can’t rely on a man or anyone to make you happy, you have to make yourself happy. I know now that to be lonely isn’t so bad, to be completely on your own to find out who you are and what hobbies you enjoy. You don’t need to go back out and find more guys, it will make the situation way worse, trust me. Read books, go on adventures, love your animals they need you, and just be happy with yourself, then everything else falls into place. It was my biggest mistake to make someone my entire world. -Its apparent from this all that I lost my confidence and style for a bit and headed down the sports luxe badass monochrome style, which even my Dad said looked awful on me haha. Worked with: She Inside, French Connection, Miss Guided. –June was a fantastic month, full of warm sunny weather and the countryside was flourished with life. Still obsessed with the Dolce Gabbana Sicilian coin trend, white lace dresses and coin printed dresses, I found locations to match the theme of the outfit. People let me into their gardens to take pictures under their blossom trees and in their rose patches, the people around my village are very interested in my fashion blog its really cute. -I got invited to the Epic Summer party hosted by ASOS and I went alone and luckily met up with Kira. At the time I didn’t know anyone there, but got a bit tipsy whoops and embarrassing introduced myself to Carrie, Dunya and a few others. I saw Megan there but I was a bit starstruck seeing her actually there it was like a dream and I was too shy to say Hello, I can get like that sometimes. –July was quite like June but even hotter, I can remember taking these photos and then finding shade pretty soon after as I was feeling dizzy. I got invited to the Paul Mitchell Hair event down in Cardiff Hotel, where I met some lovely Welsh Bloggers. It’s funny how we have never known about each other before but there are so many of us, we must be quite shy. It was a brilliant event, and the view from the Hotel over Cardiff bay was a dream. I won a dress in a Love Clothing’s twitter competition which was unexpected, the dress print was beautiful. I worked with Flossy shoes which are now my favourite company ever, the shoe actually smelt like strawberries and they are so comfortable to wear. Worked with: OASAP, Quiz Clothing, Wal G, Flossy Style Shoes.